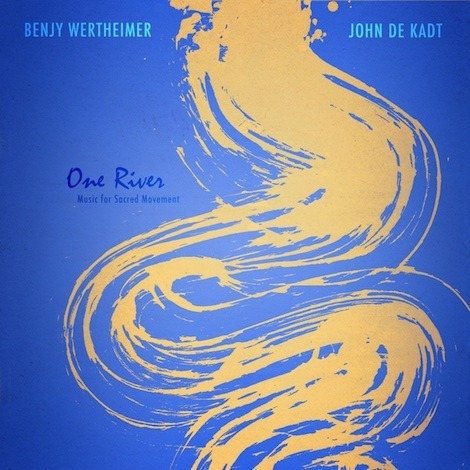 The collaboration between Benjy Wertheimer and John de Kadt in their new release One River reflects their extensive experience in providing extraordinary live soundtracks for some of the world’s leading yoga teachers (such as Shiva Rea), and invites the listener into myriad realms of sacred movement and awareness. The deep and luscious soundscapes presented on One River range from vast spaces that heal and calm the mind to energetic, playful virtuosic journeys into vigorous and transformational yogic dance. All of the selections on the CD are centered around the spellbinding melodic percussion that is the hallmark of John’s and Benjy’s work, beautifully augmented by offerings from an incredible cast of musicians, such as Wah!, the Grammy-winning flute master Steve Gorn, violinist/vocalist Jahnavi Harrison, and the angelic vocals of Heather Wertheimer. One River is a perfect support for a wide variety of sacred movement and healing practices, as well as focused listening.